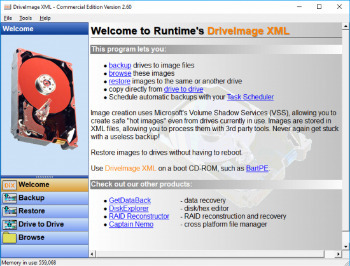 DriveImage XML is an easy to use and reliable program for imaging and backing up partitions and logical drives. Image creation uses Microsoft’s Volume Shadow Services (VSS), allowing you to create safe “hot images” even from drives currently in use. Images are stored in XML files, allowing you to process them with 3rd party tools. Never again be stuck with a useless backup! Restore images to drives without having to reboot. DriveImage XML is now faster than ever, offering two different compression levels.The program will backup, image and restore drives formatted with FAT 12, 16, 32 and NTFS.